On 9th November, as part of our preparedness for Nankai Trough Earthquake, based on previous emergency relief experiences and with the support from prefectural and local governments AMDA organized and conducted simulation to figure out and be aware of possible problems during such major calamity. Especially, how emergency relief teams are going to be transported to affected areas and how they communicate with each other were main focus for the day. According to our findings, we will revise our planning. This time, we set the supposition that an earthquake with a magnitude of 8.6 hit Nankai Trough in the waters off Shikoku island at 7 am on 11th January 2016 and three bridges connecting between main land and Shikoku island were closed. In this setting, the people both in Tokushima prefecture and in Kochi prefecture in Shikoku island are given a warning against a massive tidal wave: Tsunami. 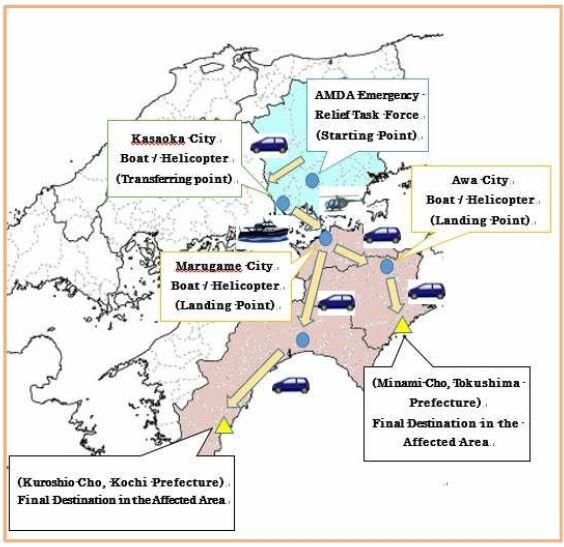 As part of the ‘disaster-simulation`, AMDA actually established a task force at 8:00 am at the headquarters of Soja city and a logistics support center at Marugame City where AMDA has been alliance with. Then, by using mobile phones via communication satellite system, AMDA staff in collaboration with Soja city at the fire department headquarters tested the system with local governments in Shikoku island and timed the test, supposing that we are receiving the emergency calls for relief aid from local governments in Shikoku island. The whole transporting simulation was operated by a relay system, as this was to test how the medical professions are going to be transferred to each affected area under the cooperation of allied cities and municipalities. After the ceremony for this collaborative activity, AMDA staff and Soja-City staff departed from Soja city, Okayama Prefecture to Marugame City, Kagawa Prefecture. To explore other means of transportation than ground, staffs were divided into two groups in Kasaoka city to make their own ways by a boat and by a helicopter to Marugame city in Kagawa prefecture, the first transit point. The team with the helicopter headed to Marugame city as planed but they had to cancel the rest of plans to fly further to “affected” destinations due to the weather condition. Upon arrival, the `boat team` had an audience with the mayor of Marugame city in the morning to assure the collaboration between the city and AMDA for the future emergency relief. Apart from those who departed from Soja city, another two teams departed from Marugame city headed towards two separate meeting points in Tokushima prefecture and in Kochi prefecture respectively. This time, the final destinations were Minami-cho in Tokushima prefecture and Kuroshio-cho in Kochi prefecture where AMDA concluded Memorandum of Understanding for future emergency relief activities in their towns. Separately, another two teams departed at meeting points in Tokushima prefecture and in Kochi prefecture respectively assuming that medical professionals were continued to be transported to the final destinations. During the simulation, each team made an arrangement to rent their cars and stopped by police stations to obtain a special permission only issued to emergency relief vehicles to pass through the road closed for regular transport. Having operated the whole process as planned, prospective issues have been found. They are going to be shared with allied local governments and some required modifications will be made on the plans. Those information will be shared with participating local governments, partnering organizations and other participants at the next conference for “Nankai Trough Earthquake Preparedness Program” in February 2016.